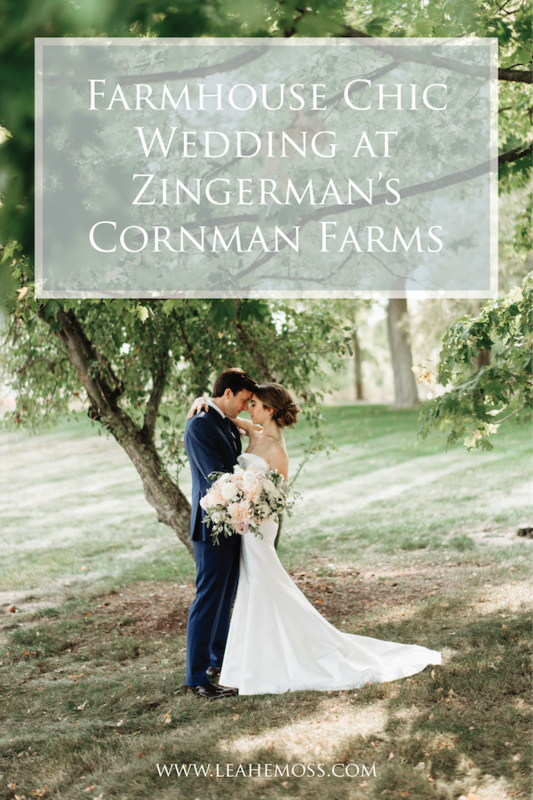 Gillian and Daniel had an epic, farmhouse chic affair at Zingerman’s Cornman Farms, located just outside of Ann Arbor, Michigan. 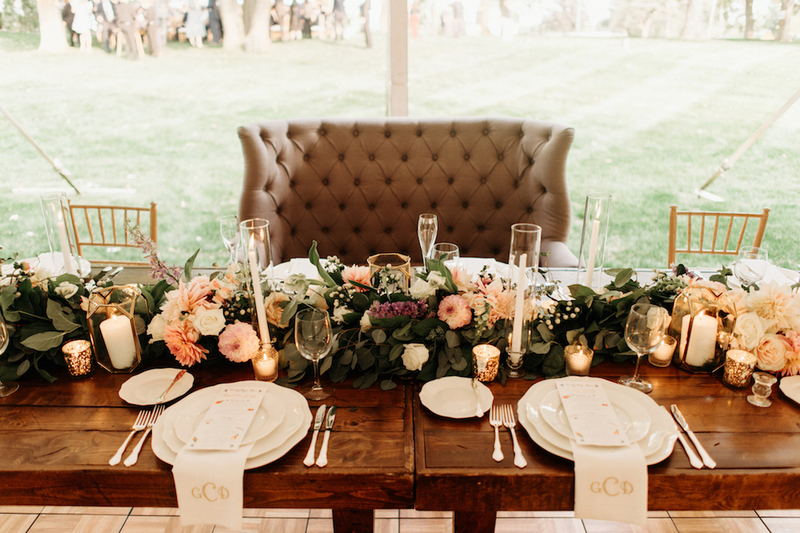 The couple resides in New York City but the lovely bride grew up here in metro Detroit. It was always a treat to connect with her when she was back in town for planning trips. Gillian’s mom Wendy first came to me to assist with the envelope addressing for their gorgeous invitations. 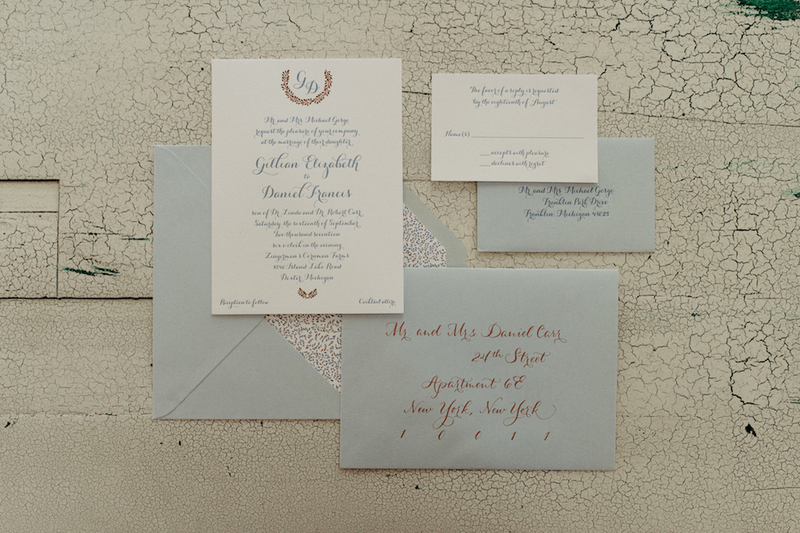 These stunners were french blue and bronze, letterpress, monogrammed, modern script goodness, created by Joann Nosan of Invitation Station (dear family friends of the bride, which I love). It was an honor to help put the cherry on top for this stationery. 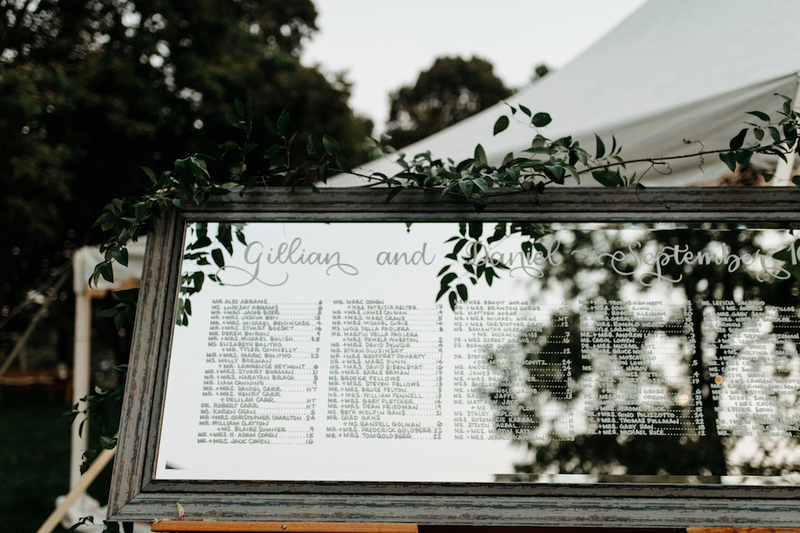 Then, for the day of the wedding, it was such a treat to help with the paper goods and mirrored seating chart for this special couple. 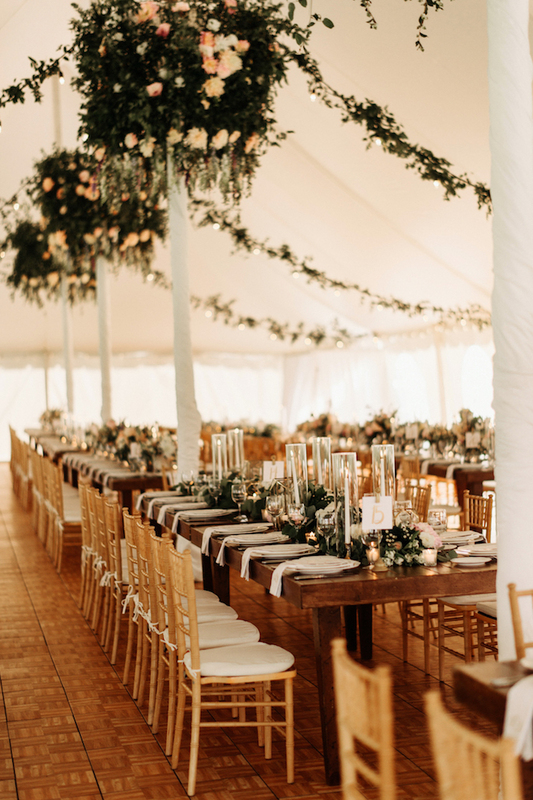 They had a picture perfect day, full of details that came together seamlessly from all vendors. The result? 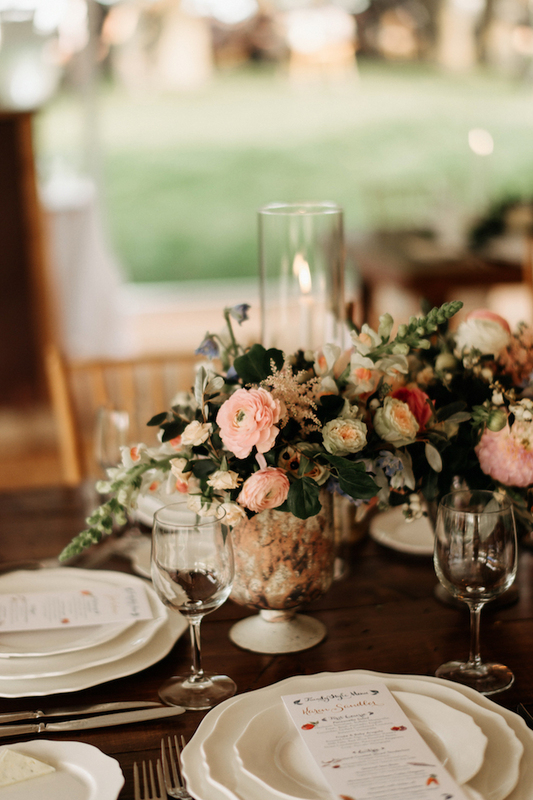 A seemingly effortless affair – this was one for the books, featured nationally on Brides! Guests witnessed a fairytale ceremony space on the Cornman Farms property, with overflowing florals in front of the classic white farmhouse. 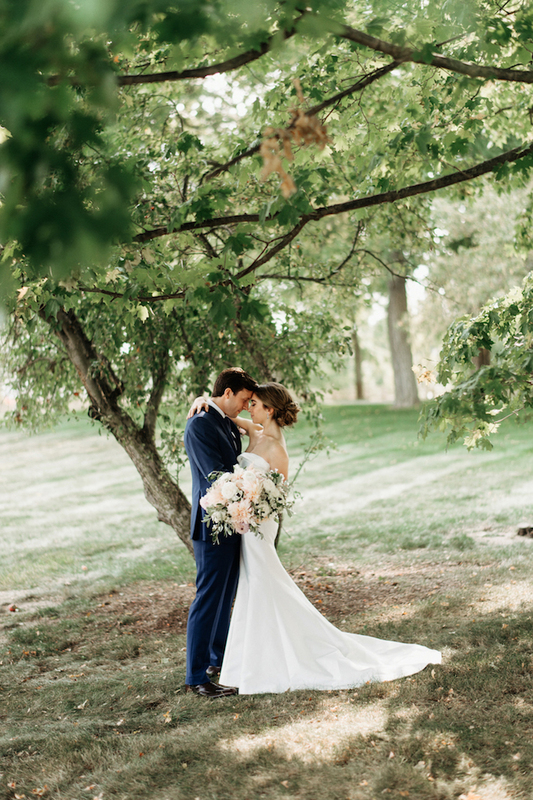 The bride wore a chic, strapless gown and carried an oversized bouquet, bursting with Michigan-grown dahlias. 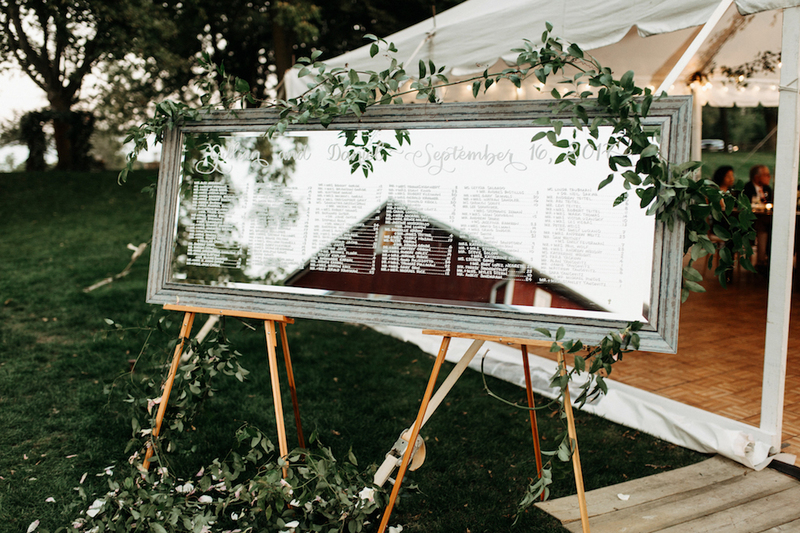 After the joyous exchange of vows, guests were welcomed into the idyllic white-top reception tent by a mirrored seating chart, which was adorned with greenery. 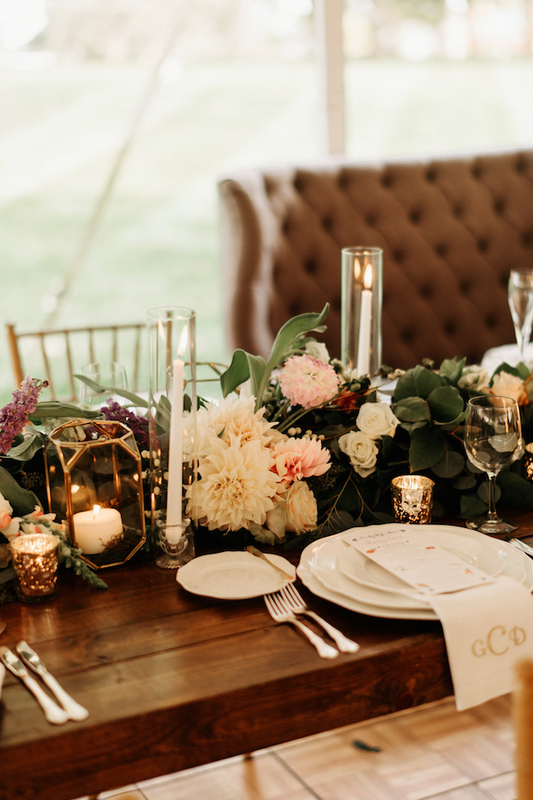 The entire tent was full of greens, blooms, and candlelight at every turn. The long, viking-style farmhouse tables made for an intimate feeling. 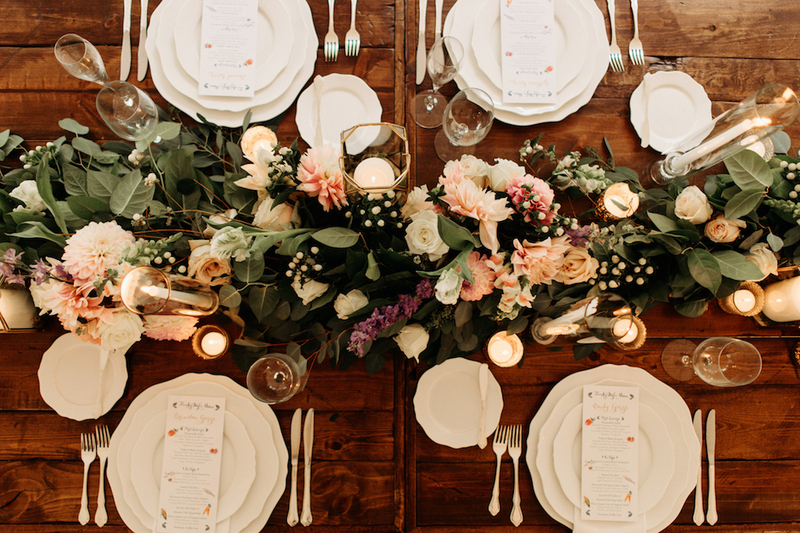 The overflowing florals, monogrammed napkins, and layers of white china place settings gave that intimacy a plush elegance. Putting together an “effortless” appearance takes a tremendous amount of effort! I created a variety of printed materials for their wedding weekend, including the hotel welcome note for loved ones, and stickers for (the cutest ever) homemade-cookie-favor bags for the end of the night. However, my hands-down favorite element I had my hand in was the menu. 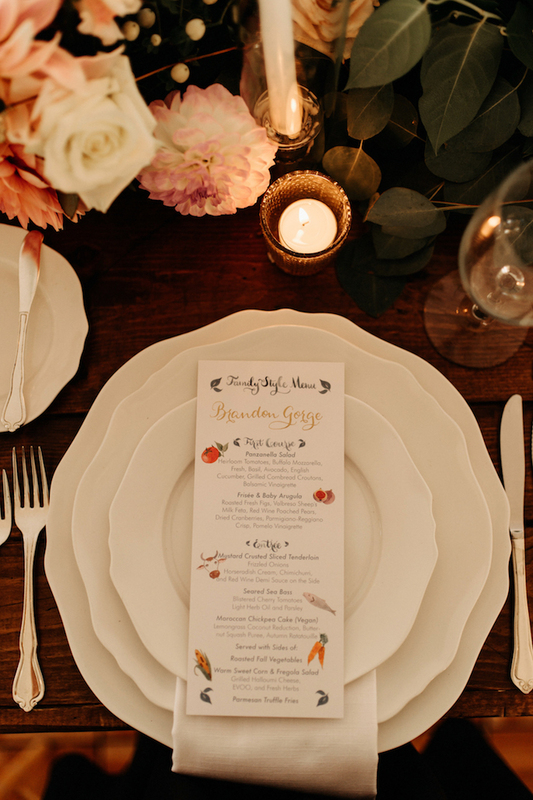 Gillian was inspired by the farmhouse setting and wanted the menu to be a fun, chic pop of bright color against the otherwise soft palette. We played up the “foodie” factor and I created illustrations for all the items. 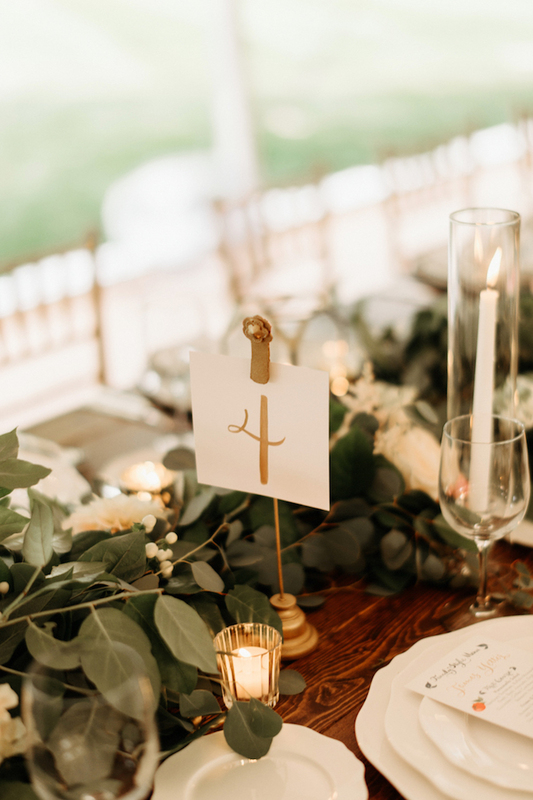 Then, each person’s menu was customized with gold calligraphy to serve as their place card. 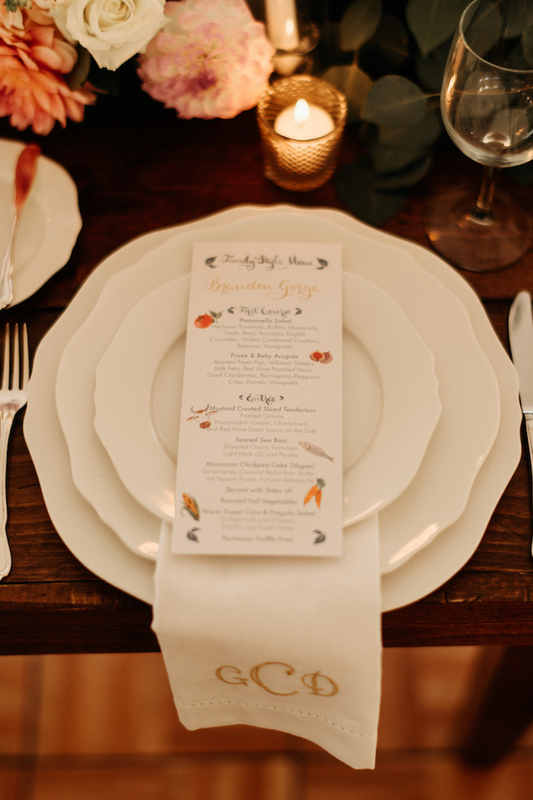 The whole thing sat atop monogrammed, embroidered napkins with the newlywed couple’s initials. Talk about personal touches! 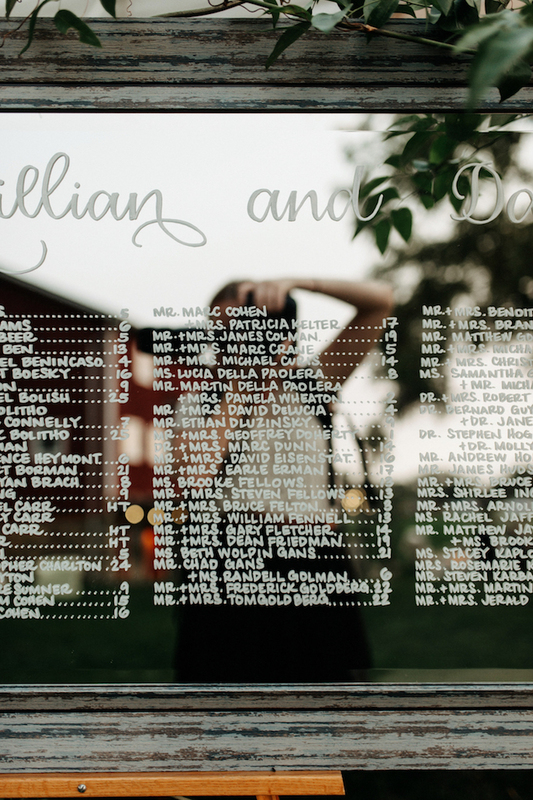 Here’s a closer look at Gillian and Daniel’s invitation design. Their initials were surrounded by a modern laurels cluster in bronze foil, with a dainty repeat element at the bottom. The french blue letterpress was sophisticated and classic, but the contemporary script style brought it into the 21st century. The whimsical pattern on the envelope liner was a fun touch, and the bronze envelope calligraphy was such a treat to contribute! This was a small snippet of the goodness from this day, but there’s lots more to swoon over on Heather’s portfolio. Want to keep inspiration from Gillian and Dan in mind? Pin this for later!